Trophy mule deer is one of the most sought after species in the west, and quality deer hunts are getting harder and harder to find. With Tangle Ridge Outfitters you can be assured a great hunting experience. 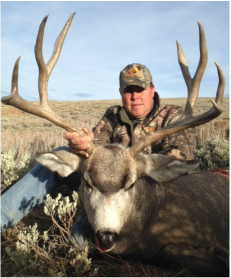 We offer many different opportunities to hunt mule deer, and most of our hunts can be conducted as either archery, rifle, or muzzleloader hunts. Depending on your hunting style preference you can choose from a mountain back-country pack-in hunt, a mountain cabin hunt conducted on private land, and two other different private ranches in the lower elevations of Wyoming. These hunts can easily be combined with an elk or antelope hunt as well. All four of our hunting locations offer good quality and quantity of deer. The deer here have good genetics and mineral rich feed which promotes exceptional antler growth. Average bucks run 20”-24”, with the older more mature bucks ranging anywhere from 25”-29” and we never rule out the possibility of finding an even better trophy. Over the past few years our success rate has been nearly 100%. These are “bragging rights” that do not come easily. We spend many days scouting and preparing for your hunt long before the seasons open. However, the harvest success of each hunt depends on weather conditions and the ability and desire of each individual. This is a Back Country Tent Camp where horses are used for riding and packing meat. This hunt is conducted on NSF land. Each tent is equipped with wood-stoves, cots, foam pads, and lighting. You'll enjoy home-style cooked meals prepared by an experienced mountain camp cook. Your horses will be cared for and ready to work for you each and everyday. This camp offers all the perks of a truly rugged western experience combined with excellent hunting opportunities. 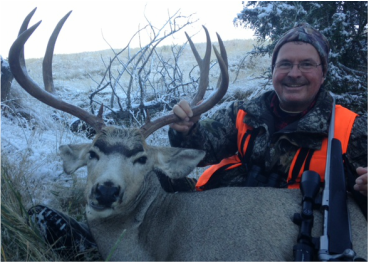 This mule deer hunt can be combined with an area 40 elk hunt. Season dates are from October 15th-October 24th. Plan to arrive and pack into camp one day before your hunt begins and pack out the day after your hunt ends. ​This hunt is the home of our Diamond Tail Cabins. The hunt is conducted on both public ground and a leased private ranch. The bunkhouse style cabins offer wood-stove heat​, electricity, running water, shower and bathroom facilities and a main cabin where all meals are prepared and served. 4x4 vehicles and ATV's are utilized on this hunt Over the past few years we have boasted a near perfect success rate! Managing the way we hunt a private ranch has been instrumental in being able to offer highly successful hunts on great trophy bucks. This hunt can be combined with an area 41 elk hunt. The season dates are October 15th-October 24th. Plan to arrive the afternoon prior to your first day of hunting. This hunt is conducted on 10 thousand acres of private land in the southeast corner of Wyoming. Accommodations are provided for this hunt in a modern day house located on the ranch. All meals are included in the price of the hunt. Bucks range in size on this ranch but we have harvested some of our biggest deer on this lease. You can combo this hunt with an antelope hunt in area 34 for an additional $1250.00. The season dates for this hunt are October 1-October 9th. This area usually has leftover tags due to an abundance of private land in the area with no access for the general public, which allows success on a tag in the lower priced license category. 8 miles of river bottom on this 10 thousand acre ranch provides supreme whitetail hunting. Hunters have a good chance at harvesting a 150+ class whitetail with us. Accommodations can be provided in cabins on the ranch including meal, or for a reduced rate you can provide your own accommodations and meals in the nearby town. This ranch has not been heavily hunted in the past few years and for several years before that only management bucks were harvested by the landowner and his family. Season dates are November 1st-30th.